Vincyte is India based business services platform brought up by professionals to help individuals as well as business houses to efficiently start and develop their business, at a reasonable price tag. Established in 2016 with the mission of making it easier for budding entrepreneurs to commence, maintain & grow their business. We uphold highest standards of commitment, confidentiality and competence and always strive for improving the quality of services rendered through the constant and continuous process of learning, training and updating with industrial needs. We aim to be “The Most Trusted Service Provider” that helps entrepreneurs in all the aspects possible and help you grow beyond imagination. Vincyte offers range of services that enable new as well as existing business houses to focus on their core competencies and rely on us for everything that a business needs to manage, whether related to internal or external affairs like Legal, Regulatory, Managerial, Financial, Branding or any allied services at reasonable cost and saves your time as being an umbrella service provider for all business needs. Our Experts help you to file your GST Returns on time without attracting penalties, under GST Monthly 3 returns has to be filled and one is yearly other than composition dealer. 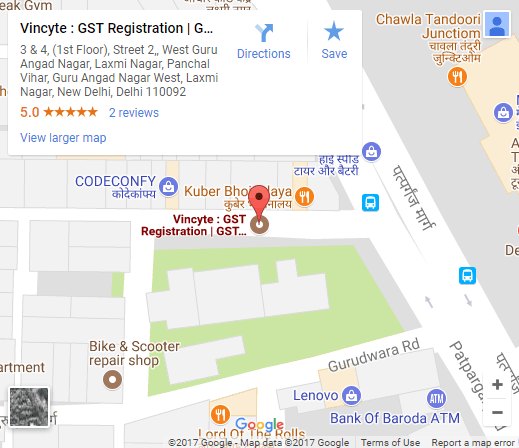 At Vincyte our experts provide you full consultancy in regard to applicability of GST, Compliance’s there under, Precautions has to be kept in order to fulfilling rules of GST. Vincyte helps you to register your business as private limited company or Public limited company in very nominal cost, also our CAs give best advise in regard to your startup growth. Now you can start your food business and make it legal with FSSAI/ food license, we help you to get basic, state & Central license, we also serves for renewal of licenses. A trademark is a recognizable sign, design, or expression which identifies products or services of a particular source from those of others, we can help you to get it registered under proper class with minimum cost. At vincyte our experts can help you in Direct & Indirect tax matters like GST, Income Tax, TDS, Advance Tax, any other issue relating to taxation. If your are corporate, we help you to complies for statutory laws like Annual Filling, statutory Audit, Intimation with ROC, etc. In today’s competitive world startups, small & medium scale enterprise faces so many challenges in business. So in order to grow your business your key focus should be on core business. Our experts help you to file & Prepare your ESCI and EPF records, returns and submit challans. Vincyte is a platform brought up by professionals to allow business owners to work freely and leave all the technicalities to the experts and focus on your experties. How can Vincyte create difference in my business? Vincyte works closely with clients and understands their requirements, study their business environment and then help entrepreneurs in decision making. No hit and trail, only real things are get done. How can Vincyte help my start-up? Vincyte treats startup as a customer, not the client. It very well understands the roadblock faced by startups, their needs, and requirements and provides them with a one-stop solution in order to nurture your idea and taking it to the next level to become a successful startup. We do offer a lot of services supporting young entrepreneurs through mentoring and developing and creating opportunities for other people and helping the country to accomplish the journey of entrepreneurship through startups and creating a startup ecosystem. Does Vincyte offer to brand my business ? Vincyte helps entrepreneurs to brand their business like provides services for Web designing & developments, Online marketing like SEO, SMM, Videos, and launchers etc. We uphold highest standards of commitment, confidentiality, and competence and always strive for improving the quality of services rendered through constant and continuous process of learning, training and updating with industrial needs.